Champernell was dealt several major blows in her life. She worked hard to get herself and three children back on their feet…twice. The Mission of Yahweh nominated her for the Mirror Mirror makeover. It was an honor to work with such a strong, gentle and determined woman. This story aired on Mirror Mirror on December 8, 2013. Here’s a link to watch it on the Livewell Network. Here’s the story behind the story. I do makeovers with my clients all the time. In real life a makeover typically happens over the course of several weeks or even months. This is the first time I’ve done a TV makeover…the schedule is lightening fast! I had just 3 hours to do the clothing and accessories. Luckily, my intern Crystal Johnson was available to assist. I did Champernell’s style assessment off-camera, between takes in the Limo. 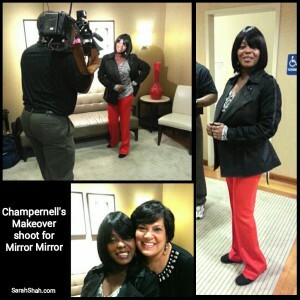 Champernell was looking for outfits she could wear for her current job, interviews, and church. 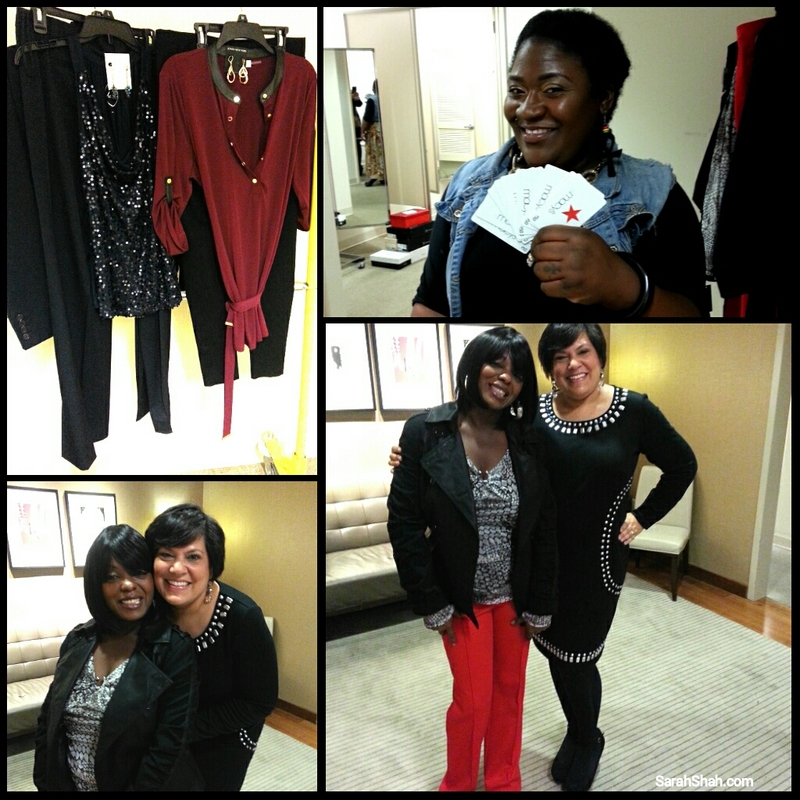 Crystal was standing by at Macy’s and selected some clothing and shoe options while the limo transported us through rush-hour traffic from Champerness’s home to the salon on the other end of town. Thank goodness for Crystal! There was no way I could have done this makeover on my own! I pulled more outfit options, did fittings and coordinated accessories with Champernell between her other makeover steps. Overlapping these activities gave me and Crystal the time we needed to get 3 outfits that Champernell loved. It’s not so hard to get three flattering outfits created. It’s REALLY hard to create three outfits a person really LOVES in such a short time. 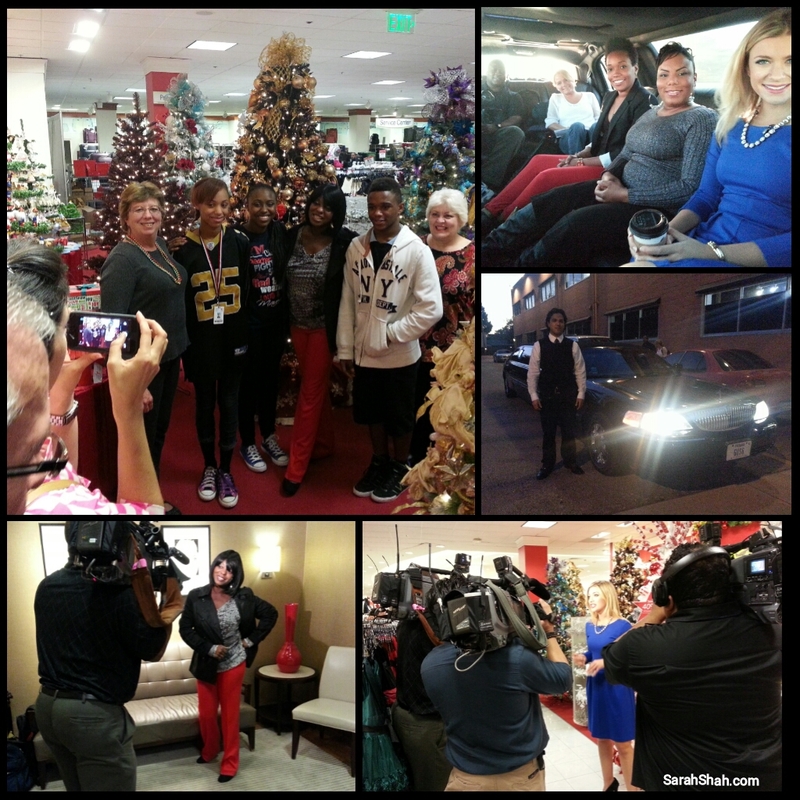 Champernell went home with three outfits shoes and jewelry: a navy suit with sequin top for church, a tunic and skinny pants for work, and the outfit she wore on camera. She can mix-and-match all the pieces to make 9 outfits will take her anywhere she needs to go – church, a formal interview, an informal interview, work in a professional environment, work in a more casual environment…even on a date. Thank you Rebecca and Sabrina for inviting me to be a part of such a fulfilling and fun experience. Thank you Crystal for saving my bacon! Makeover team: styling by Sarah Shah and Crystal Johnson, clothing and accessories by Macy’s, hair by Monique Mack, skincare by Suwuan English, and Dior Makeup by Sarah Habenicht. This experience changed my life… Thanks Rebecca and Barbara , and all everyone that made this day possible.